I hope everyone had a fun and safe Halloween! Ours was great. We didn’t do the door-to-door trick-or-treating this year because Nathan tends to get scared easily. Plus it’s a LOT of work hauling a very strong-willed two-year-old from house to house. So instead, we decided to to Trunk-or-Treat this year at a local church. If you’ve never heard of it, it’s where a bunch of folks get together in a parking lot, decorate the insides of their car trunks, and hand out candy to trick-or-treaters. I’m not affiliated with the particular denomination of this church, so I was worried that there might be a covert anti-Halloween atmosphere. See, when I was growing up, the churches we attended were really strict when it came to “worldly” things… such as celebrating Halloween. I’ll never forget being told that Halloween glorified Satan, especially when one dressed up as a witch, goblin, devil, etc. The times my brother and I were allowed to go trick-or-treating, I could never be anything “satanic.” I remember one year, I wanted so badly to be a skeleton, but I had to be a clown instead. It finally got to the point that I just didn’t want to fool with it… the desire to participate in Halloween activities seemed to always erupt into an argument between our parents and us. Now that I’m an adult with my own child, I am doing things a bit differently. I don’t think Halloween is a Satanic holiday, as long as that’s not what you let it become in your family. Maybe for some people, sure. But then again, I’m sure those very same people can turn any day into a Satanic holiday, including Christmas and Easter. That’s their business. For me, Halloween is a time to have fun, dress up in cool costumes, and collect free candy. Nothing more, nothing less. It’s all in good fun, and I am 100% certain that if I let my child dress as a devil one year, he will not be “glorifying” Satan nor will it turn him evil. I think when I was growing up, I was over-sheltered. My parents tried so hard to protect me from the world. Their intent was honorable, and I know they had my and my brother’s best interest at heart. However, once I turned 18 and moved out, the world hit me full-force. I was so naive and completely unprepared for real life, and I ended up getting myself into some trouble simply because I truly didn’t know any better. So. That being said, I won’t be sheltering my child as much. I think he should be exposed to things that way we can talk about it and I can explain it to him. He won’t be hit by a ton of bricks, so to speak, when he finally moves out. At first, we weren’t going to take Nathan at all since he’s so young and wouldn’t understand. 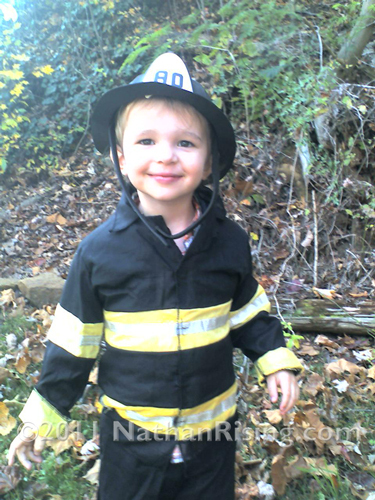 But on Sunday (the day of the trunk-or-treat), I asked Nathan if he wanted to go trick-or-treating. His little eyes completely lit up. “Tricker treat?” he smiled. “Yeah?” He was like a happy little elf, running around, bouncing with every step in anticipation of this thing called Tricker Treat. He had no idea what it was, yet he wanted to do it. So I told him we would go to the store and get him a costume. 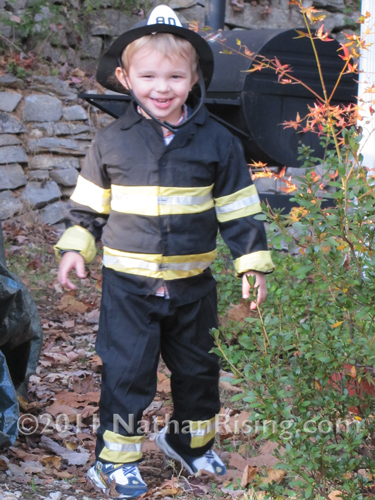 So my little man was a fireman this year and he absolutely LOVED it. After I put his costume on him and told him what it was, he was as happy as a bug in a rug. His whole face lit up and he could barely contain his excitement. 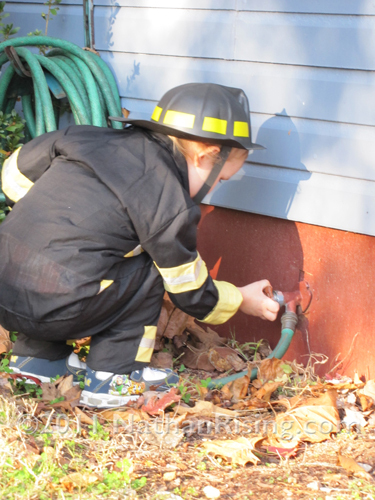 Just like a fireman... checking out the water hose! At any rate, I was worried that the church trunk-or-treat would be anti-Halloween. But it wasn’t! I was pleasantly surprised to see trunks decorated with witches, ghosts, giant spiderwebs, goblins, and creepy music. I saw ghouls and goblins roaming around with jack-o-lanterns stuffed to the brim with candy. Everyone was super friendly and no one pestered me with uncomfortable attempts to get us to attend their church services. They even had someone making s’mores over a little fire (with a tent set up for good measure) and were giving out free food like hotdogs, hamburgers, and drinks. They even had an area set up for pictures, complete with a photographer, and they will print and mail the picture for free. It was awesome. And a great testimony as well. I was super impressed with the whole thing… and how there seemed to be no affiliation to their particular denomination other than it was held in the church parking lot. That, my friends, is the best way to witness to people- No “bible thumping” and no shoving the message down anyone’s throat. That is what impresses people and will make them more apt to visit your church. Paul was unable to make it to the event with us, so it was just me and Nathan. Nathan didn’t really understand the whole thing in it’s entirety, but that’s ok. He still had a blast helping me hold out his bag, and he loved the plopping sound the candy made as it thunked to the bottom. Every time, he would peer into his bag at the candy that was slowly accumulating. Nathan especially loved when the candy-givers would let him get his own piece of candy. He would rake his hands through the bounty and slowly examine three or four pieces before deciding on one. Then he’d open his bag and watch as he dropped it inside. By the time we made it around the parking lot and oohed-and-ahhed over the scary decorations, Nathan had his fill. It had only taken 30 minutes, which is perfect for a little guy like Nathan. Unfortunately, because he was starting to get fussy, we couldn’t grab any of the food. I was a little sad because my mouth was on full-salivation mode as the smell of grilled hamburgers wafted lazily through the crisp air. But that’s okay. There is always next year! 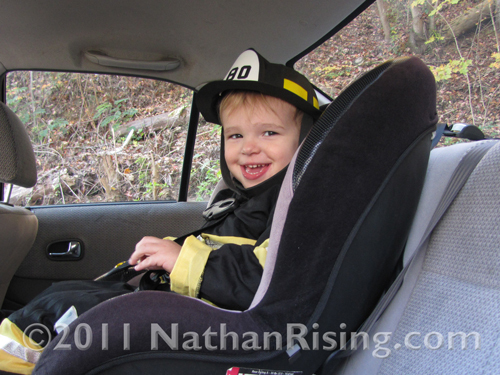 When we got home, I turned and faced Nathan as he sat in his car seat, babbling happily about Tricker Treat and firemen. I gave him a Smarty to eat. He plopped it into his mouth and chewed. And made the funniest face I have ever seen. EVER! You would have thought I’d given him the world’s most sour lemon. His face crinkled up, his eyes squinted shut, and he opened his mouth and stuck his Smarty-peppered tongue out with a pained grimace. It was too sweet for him! Even though I love love love sweets, we don’t eat a lot of them at home, so he’s not had a lot of exposure to processed sugar. The sweetness overwhelmed him! I tried to coerce him into eating another one so I could get it on video, but he was too smart for that. And then the next day (yesterday, Halloween itself) I tried to coax him into trying again. And he still refused. I can’t believe my child refuses to eat sugar! I’m thankful though. It’s (hopefully) less cavities I have to worry about and less health problems. I don’t really want him eating a lot of that stuff because it’s simply not good for him. But I don’t mind it on special occasions, such as Halloween. I bet he will be more willing to eat it next year! Such a happy little guy! This entry was posted by Jen on November 1, 2011 at 7:51 pm, and is filed under Holidays and Special Occasions. Follow any responses to this post through RSS 2.0.You can skip to the end and leave a response. Pinging is currently not allowed. How does time go by so quickly?